Want to give the gift of cocktailing this season? We can’t blame you—we can usually use a dry martini right around December fifteenth. And everyday after that until New Years. If you know someone like that, consider a special edition of (BELVEDERE)RED paired with four swank red martini glasses crafted by Marquis by Waterford. 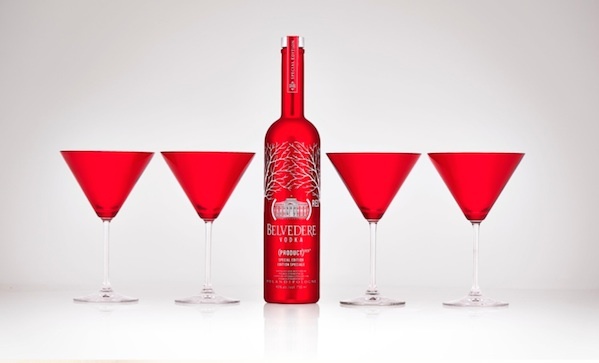 BELVEDERE)RED is available now through the holidays (prices vary), and the martini glasses can be purchased from William Ashley ($59 for a set of four). As a bonus, proceeds from the sale of both items go to the Global Fund, the world’s leading financier of programs to end HIV/AIDS in Africa, amongst many other noble goals. And after all, if you give the gift of liquor and multiple glasses, you’re likely to be invited for a drink—and shared moments like that make the holidays a bit less crass and a bit more charming.